Castillo San Felipe cost the equivalent of 2 trillion U.S. dollars. There's something a bit odd about everything connected to the The War of Jenkins Ear. For instance, take how it came about in the 1730s - when the commander of a Spanish patrol boat captured a British frigate off the coast of Florida, and for some reason cut off one of English captain's ears. And how the war showcased what's since become one of Latin America's top tourism attractions. The story goes back to an oft-broken treaty between Spain and England, mainly dealing with the sale of slaves in Latin America. While searching the British ship for contraband, Julio Leon Fandino, the Spanish commander, committed what amounted to an act of war when he decided to lop an ear off the Brit captain, Robert Jenkins. Tourists mosey along the fort's walkways. Named to lead the naval campaign was English Admiral Edward "Old Grog" Vernon, who first took on the Spaniards at their base in Portobelo, Panama. Flushed with victory there, Old Grog next sailed his Jamaica-based fleet down to Colombia to do battle with the Spanish again in Cartagena - and literally ran into a stone wall. Old Grog tried to invade the city in mid-1741 with a force of 27,000 men and 186 ships bristling with 2,000 cannons. Castillo San Felipe, the Spanish fortress - defended by just 3,000 Spanish troops and six ships - proved to be impregnable in a month-long siege of the city. After several more unsuccessful invasion attempts, Old Grog called it quits and high-tailed it back to Jamaica. Bell atop the fort alerted soldiers to raiders. The Spanish victory at Cartagena is considered one of the greatest defeats of the Royal Navy. Also red-faced after the battle were 4,000 American colonists from Virginia who fought for Admiral Vernon under the command of Lawrence Washington, half-brother of George Washington. Looking much like a mountain of concrete, the fortress - which over the years cost the equivalent of 2 trillion U.S. dollars - is in remarkably good shape. Visitors will rub elbows with thousands of other tourists climbing its walkways (it takes about 15 minutes to get to the top), scampering around its bunkers and batteries and posing for pictures on its cannons. From the highest level it's easy to see how sharp-eyed Spanish gunners could blast enemy ships down in the bay, and in another direction pick off soldiers trying to attack the fortress on foot. Another eye-popping view from the top of the fortress is a panorama of this city of a million or so people. In one section you'll spot modern high-rise condos, in another the domes and soaring crosses of historic churches, and in another rows of glassy office buildings. 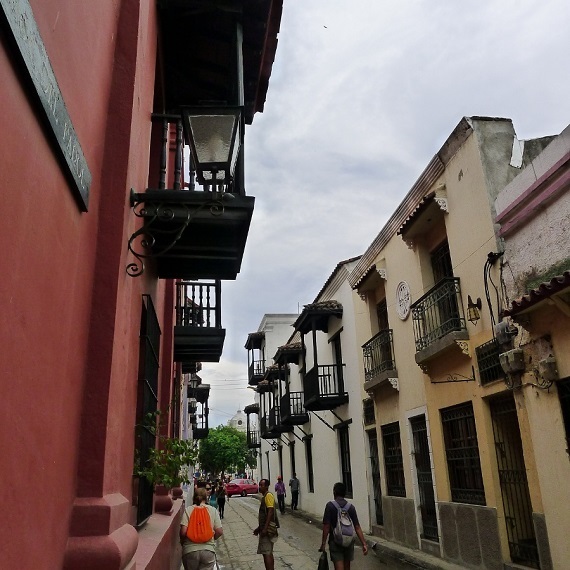 A must-do in Cartagena is to take a trip back to its colonial days by wandering around Old Town behind the city walls. You'll stroll through narrow cobbled lanes lined with buildings painted in pastel blues, greens, yellows, reds, pinks and browns, many of them the mansions of shipping barons and bankers. Adding to the Andalusian fantasy of Old Town's seemingly endless blocks are elaborately decorated arched doorways and balconies with flowers poking through iron railings and lattices. Keep walking and you'll saunter by charming al fresco restaurants, all kinds of bars, museums, churches, convents and statues of Colombian heroes. A tip: Don't miss a look at the dark side of old world Spain in the Palace of the Inquisition. Colonial-era homes line the lanes of Old Town. Photo by Robert W. Bone. Need a rest? You're welcome to join the local folks snoozing or chatting on benches around the area's magnificent squares and parks while musicians, jugglers, clowns, mimes and the like pass by, hoping to earn a few pesos from the visitors. Staying there: Cartagena offers better than 90 tourist-class hotels in and around the city. Historical notes: Shut your eyes and try to imagine dozens of 500-ton treasure galleons slicing their way across the Atlantic to Spain, their immense sails emblazoned with the fiery red cross of the Holy Roman Empire. Mostly loaded at Cartagena, the ships carried silver, gold, cacao (chocolate) beans, chili peppers, tobacco and other bounties of the New World ripped from mines and plantations across Central and South America. The treasure shipments, started in the 1560s, went on for over 200 years. The trips ended on the docks of Seville, Spain, where a government office controlled all ventures into the New World and collected taxes on imported goods. 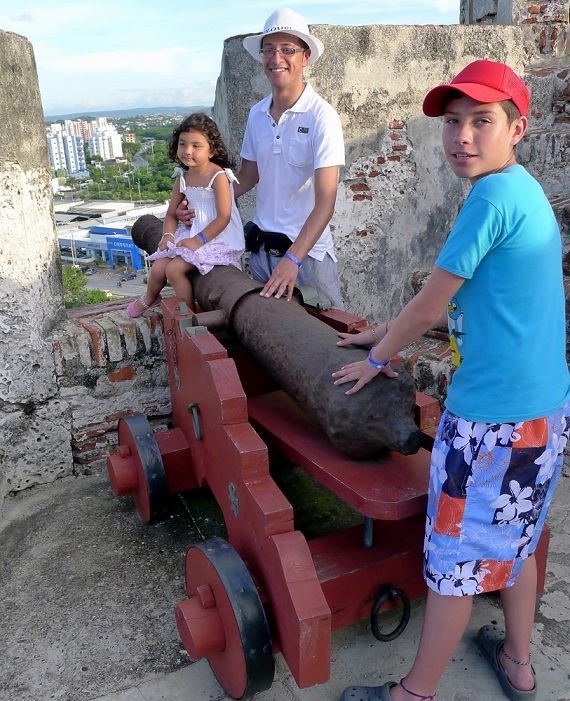 Pirate ships like this routinely plundered Cartagena before defenses were built around the city. Brimming over with profits from the treasure shipments - and from a marketplace for incoming loads of slaves from Africa - early Cartagena was a sitting duck for pirates roaming the Caribbean. It was likely the most looted port in the New World until Spain got its act together to defend the city, circling it with a 7-mile-long wall studded with gun turrets backed up by forts in key locations. The crown jewel of the defense network was the monster fortress of Castillo San Felipe, built atop a 130-foot-high hill towering over the city. It was the greatest fortress Spain ever built in the New World. Photos by Bob Schulman unless otherwise noted.